How people work, communicate, collaborate, and manage responsibilities has changed. Knowing how to build influence and lead others without title or authority, no matter what your role, is now a workplace necessity. No one needs to appoint you, promote you, or nominate you. You decide. It's not rank that will get you results; its the actions. Using the revolutionary tactics laid out in The Titleless Leader, you'll turbocharge your career and discover how to get things done...even without a title. Nan S. Russell has shared her workplace insights and practical wisdom with a wide variety of people, from coal miners and Navy engineers to college students and senior leaders at nonprofits and Fortune 100 corporations, igniting passions, crystallizing thinking, and changing results. She's a national speaker, consultant, and radio host, the award-winning author of Hitting Your Stride, a blogger for PsychologyToday.com, and the job-loss recovery expert for Job-Hunt.org. Her column, "Winning at Working," can be found in more than 90 publications. Nan has a B.A. from Stanford University and an M.A. from the University of Michigan. She lives with her husband in northwestern Montana. "Nan has an uncommon and comprehensive understanding of the workplace. Her talent is embracing and encouraging the diverse gifts of every member of the team, a proven formula for success, and a genuine approach to leadership." 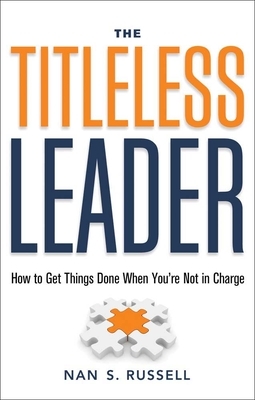 "The Titleless Leader is inspiring, enlightening, and engaging! It is so refreshingly different from other management/leadership books that work to get you to be someone you are not. Nan's book inspires you to be your best self, your authentic self, and build your leadership skills from your center--from the best of who you are!"